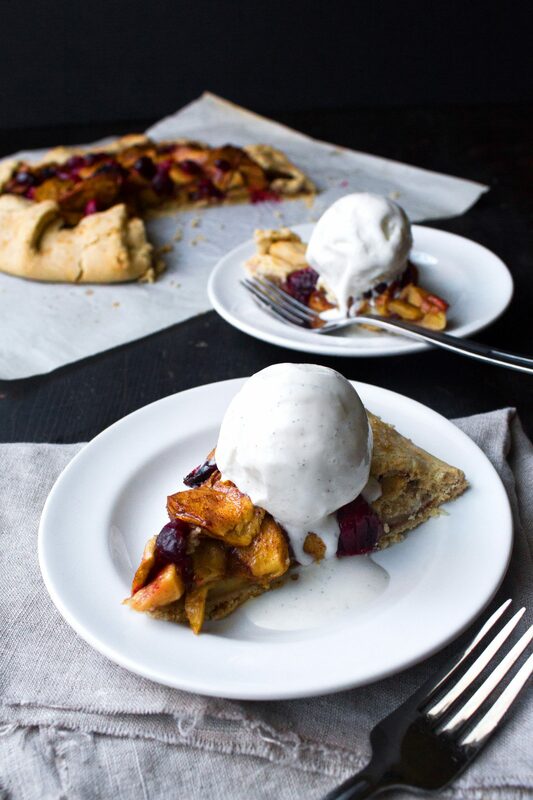 Classic peach pie made gluten, dairy, and refined sugar free! Perfect way to enjoy this summer fruit! 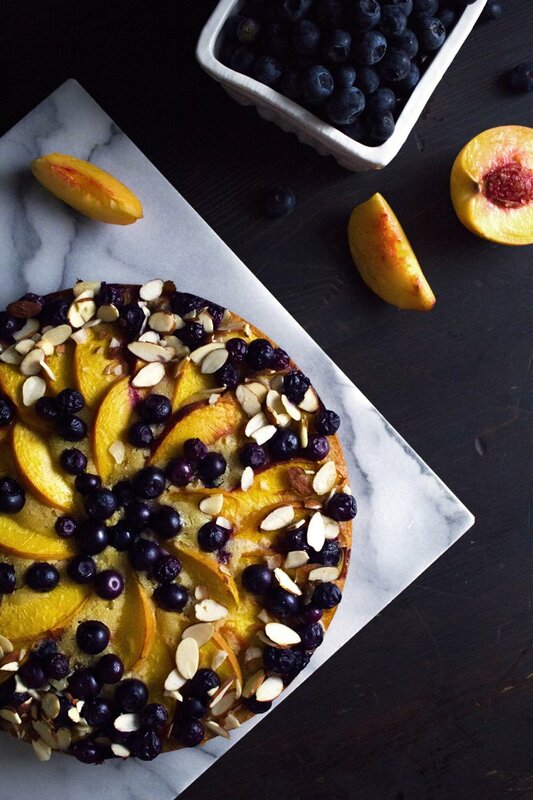 What better way to enjoy some perfectly sweet, end of season fruit than in a pie. Sure, you can just pick up the fruit and eat it, but anyone can do that. There’s something deeply satisfying about making your own pie from scratch. I’m not going to sit here and tell you making pastry from scratch is a walk in the park. It can be challenging, especially when you don’t have the help of gluten to hold everything together. It’s a test of perseverance, but when you emerge out of the kitchen holding your pie and your family oohs and ahs at your beautiful creation, you’ll know it was all worth it. Peach pie is probably my favorite, aside from a good Berry Pie, but you can easily substitute another stone fruit, like plums, nectarines, apricots, pluots, etc., in place of the peaches. Thinly sliced apples can also be used, but since they’re generally not as juicy as peaches, you’ll need to half the amount of cornstarch in the filling. I definitely recommend using parchment or plastic wrap to roll out the dough. Gluten-free pastry can be a little more sticky and generally less malleable than regular pastry. Parchment not only keeps it from sticking, it also helps you transfer the dough to the pie plate. Trying to pick it up with your hands will most likely result in it breaking into pieces and shattering all of your hopes and dreams. Trust me on this one. You can easily roll out another whole piece of dough for the top and cut slits to let steam escape. This would be the easiest method. But if you’re up for the challenge, a lattice crust is definitely beautiful and impressive! I recommend rolling out the dough a little thicker than the bottom crust. You also want to make sure the dough is cold, which will help it hold together better and be sure to loosen the strip from the paper using a thin, offset spatula. If a strip breaks while you’re working with it, just pinch it back together again…or re-roll and re-cut, if you’re a perfectionist like me. The only thing that makes a slice of this homemade pie better is one topped with a scoop of vanilla ice cream. Simple yet delicious. Sometimes simple is best, don’t you agree? This classic peach pie maintains its deliciousness while being free of gluten, dairy, and refined sugar. Blend flours, sugar, xanthan gum, and salt in large mixing bowl. Cut in shortening/butter until mixture is crumbly and no large chunks of fat remain. Stir together vinegar and eggs until well blended and add to the flour mixture. Slowly stir in water one tablespoon at a time, just until dough holds together. Divide dough in half and shape into round, flat discs. Wrap each in plastic wrap and chill for 20-30 minutes. While the dough chills, prepare the filling. Peel peaches, cut in half, remove the pit, and slice. Place slices into a bowl and stir in sugar, lemon juice, cinnamon, cornstarch, salt, & vanilla. Preheat oven to 400F. Lightly grease a 9-inch pie plate. Remove one disc from the fridge and place between two pieces of parchment paper or plastic wrap. Roll into a large circle, a few inches larger than your pie plate. Use the paper or plastic wrap to invert the dough into the plate. Gently press to fit into the bottom and up the sides of the plate. If the dough breaks, just press back together. Add any excess dough to the second disc. Remove the second disc from the fridge and roll out into a rectangle the width of your pie plate and cut at least 6 two-inch strips to make a lattice crust or roll into another circle to make a full top crust for the top. Careful not to roll too thin or it won't hold together well. You can also cut shapes out with cookie cutters and place on top of the filling. Crust works better chilled so place back into the fridge if it starts to become difficult to work with. Also, if dough is too crumbly, knead in a little more water until it becomes a soft dough again. Pour the filling into the pie pan and top with the crust. If making a lattice crust, weave strips alternately over and under to make the basket-weave pattern. Just keep in mind, gluten-free dough isn't as malleable as dough made with regular all-purpose flour, so this technique will require some patience and possibly pinching torn strips back together again (If you need a visual to make a lattice crust, I found this tutorial helpful). For the edge, you can use a fork to crimp the edges or to make a fluted edge like in the photo above, you can follow the technique used here. Beat egg with water and use a pastry brush to brush egg wash all over the dough to help it brown in the oven. Place pie onto a baking sheet and place into the preheated oven on the middle rack. Bake until pie is golden brown and filling is bubbling (or if you're able, pierce a peach to see if it's tender) about 45-60 minutes, depending on your oven. Let cool. You can serve right away, but pie may be crumbly straight from the oven. Pie slices better when allowed to sit overnight or after being refrigerated for several hours. Ready to make this recipe and although it calls for cornstarch, it doesn’t say when to add it in the recipe. Do I make the peach filling on the stove first or add it to ???? Hi Maux! Sorry about that, just updated the recipe! It’s supposed to be added with the sugar and spices. You just mix it together in a bowl before adding it to the crust. No need for cooking first. I hope you enjoy it! Happy Thanksgiving!! Thanks. I didn’t receive your response until after I made the filling. Hoping that it comes out ok.
Oh yummy! This peach pie looks so delicious, Joscelyn. And these delicious pictures are literally making me drool. I wish I could grab that platter through my computer screen. Your pictures are fabulous, and makes me want to dive into your desserts. I also love that the ingredients are accessible to most. 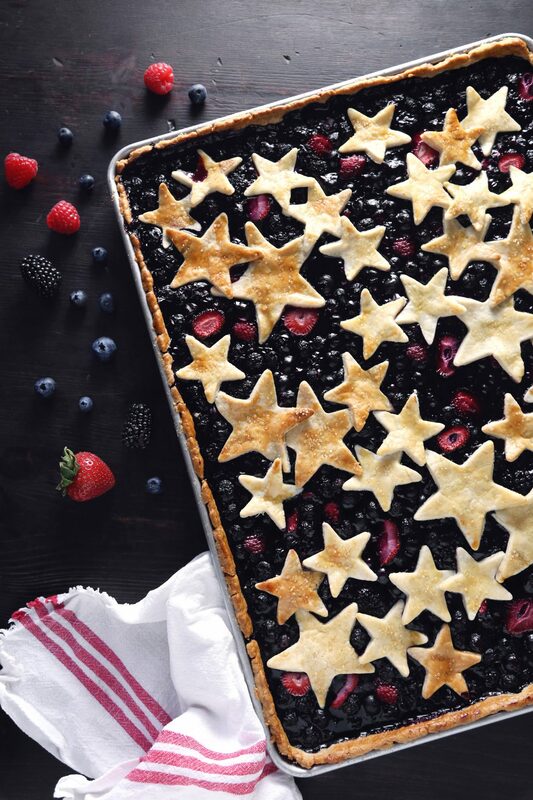 I’ve never been a big pie person, but that looks so pretty and so tasty that I bet I would Love it! Looks incredible, I love the stars on top! Just need to find a sub for those eggs (vegan) and I’m in business. Definitely trying this out! This recipe looks amazing! I made a peach crumble a few weeks ago. So delicious. You can’t have a (peach) pie without ice cream, right?! Amazed and intrigued that this recipe is GF and refined sugar free 🙂 you rock! you make the prettiest desserts! 🙂 looks lovely! Thank you, Manali. Have a great weekend, friend!